How Much Does a PlayStation 4 Cost? Looking to buy a PlayStation 4? It’s a great choice! A gaming console is a cost-effective way to play the best games 5 Reasons to Buy a Game Console Right Now 5 Reasons to Buy a Game Console Right Now Thinking about buying a gaming console? You're in luck, because now is the perfect time to buy one! Here's why you should look into the new consoles this holiday season. Read More . But how much can you expect to spend on a new PS4? Sony has two PS4 models on the market right now: the PS4 Slim and the PS4 Pro PS4 Pro & PS4 Slim: Are They Worth the Money? PS4 Pro & PS4 Slim: Are They Worth the Money? Sony has announced their new PS4 Pro and PS4 Slim! But are either of them worth the money? Here are all the details you need to know! Read More . The original model of the PS4 isn’t sold brand-new anymore, so you’ll only find it used and refurbished. However, since the PS4 Slim only features marginal improvements to the original model, there’s little reason to seek out the 2013 PS4 model unless you want to play at the absolute lowest price. How Much Is a PlayStation 4? The PS4 Slim’s retail price is $300. This system includes a 1TB hard drive, up from the 500GB drive in the original PS4 model. Many retailers sell bundles, including a game such as Call of Duty: WWII or Star Wars Battlefront II, with the console for the same $300 price. The PS4 Pro costs $400 at regular retail price. Like the Slim, the PS4 Pro features a 1TB hard drive. Some bundles, including one with Destiny II and another with Star Wars Battlefront II, cost $450. Of course, you can likely find a used PS4 console for cheaper. You could always upgrade the hard drive yourself How To Upgrade Your PS4's Hard Drive How To Upgrade Your PS4's Hard Drive The PS4 makes it easy to add more storage space. Let's look at what drives you can choose between and how the process works. Read More or add an external drive if the default drive isn’t big enough for you. If you have a 4K TV and want to future-proof your gaming, the PS4 Pro might be worth the extra cost. Aside from more power internals, it also includes an extra USB port. For everyone else, the PS4 Slim provides a great value for a console that’s still plenty powerful. Just don’t forget that you’ll need to factor in the price of some games and a PlayStation Plus subscription, if you plan to play online. 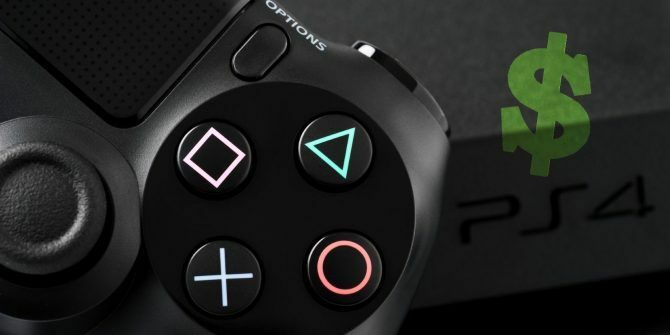 You may also want to get an upgraded PS4 controller The 6 Best PS4 Controllers to Buy This Year The 6 Best PS4 Controllers to Buy This Year We've found some of the best PS4 controllers for a variety of budgets and play styles. Just in time for Christmas! Read More at some point. Explore more about: PlayStation 4.